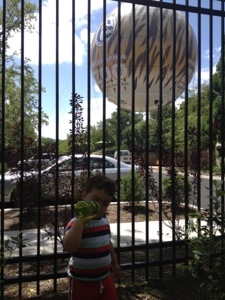 A funny thing happened on the way to the zoo. I forgot to charge the battery so there was very little battery left. No idea how much but the last light was blinking so I shut it down. Yikes. But my kid has been begging for the zoo & I like to think biking at now eight weeks post partum I am as strong as I was before. But alas I'm not. 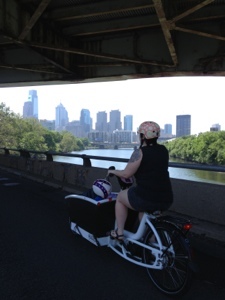 Also it happened to be 86% humidity out and oh the Philly Tri was happening on our direct route to the Zoo. Let's just say we made it, my body was feeling that whole humidity thing and now you are biking 100 pound bike up and down hills feels great, but we made it. 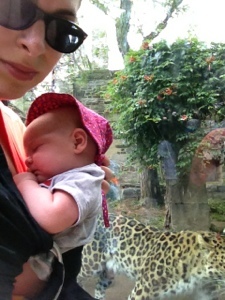 I promised that toddler giraffes, monkeys & lions and this mama does not let down! ps great news, looks like our official Urban Arrrow maxi cosi holder should be in this week as well six more UAs to our shores! Nice. A few weeks ago Sibyl a local Philadelphia mom whose website Hipster Henry, features what to do with kids here in Philly, offered me a complimentary spot at her Papa Palooza event held at the Piazza for Kidical Mass rides. 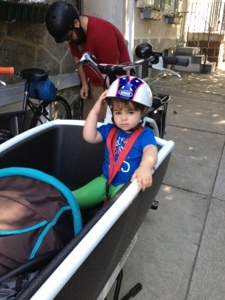 I figured why not this helps other parents learn about biking with kids and gives us something to do on Saturday. "Us", why of course I dragged the whole family. In a time not so long ago I worked an out of the house job as a director of a historic site, so my husband is use to being volunteered for weekend events. And well my kids will just get use to that too. By the way the kids totally enjoyed the event. 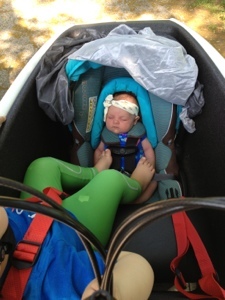 As there were two kid bands, a trip to liberty lands park and a bike nap involved for the toddler. So clearly we biked. 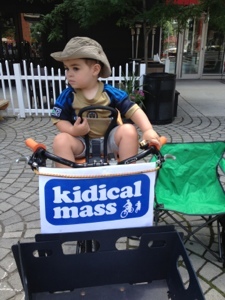 But since we were "tabling" for an event we had a little extra cargo. 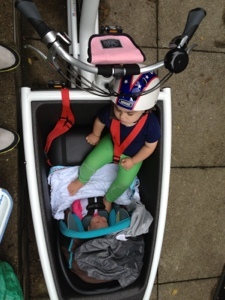 Although the Urban Arrow has a large box that is taken up by J's carseat. 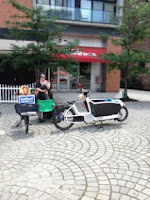 So we were able to pile in the Halsted's basket with folding chairs, signs/handouts, the Yepp mini, our diaper bag, a smaller cooler with food and our water bottles. Full load. The bike was a little tippy bit held up well. Tabling went well. 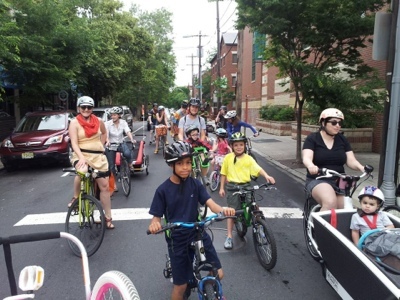 We met a lot of people who seemed to want to bike with kids but just didn't know how. 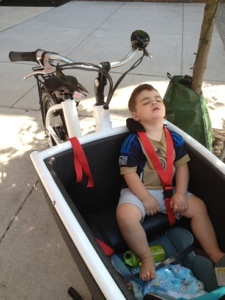 A las the point if this blog and other family biking blogs is to help with that. But talking to someone in person is a really helpful jumping off point. People asked about seats, trailers and of course we got a bunch of questions about our bikes. 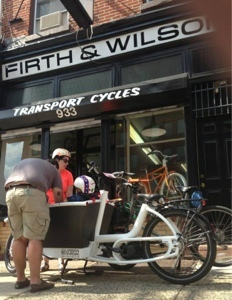 After we wrapped up tabling we biked up Spring Garden to visit the new bike shop Firth & Wilson that is specializing in transport and cargo bikes. 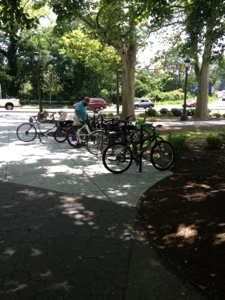 The proprietors came out to greet us and check out the bikes. They were incredibly gracious and helped us out with a fender issue as well let me tend to J (nurse and diaper) inside the shop. 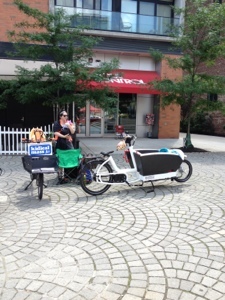 They carry some great brands, Brooklyn cruiser, Civia and will have Workcycles as well. I'm smitten with a set of basil panniers they had so I will likely be back soon! I hope they will carry kids seat but I honestly forgot to ask. At the least they knew the Yepp seat so they are probably knowledgeable to help point you in a good direction if they don't. Both of the owners are also frame builders besides what they carry. As a bonus the shop is equip to work on big bikes which was great to see. So that wraps up our weekend ride. 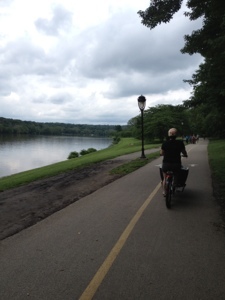 I plan to start biking around the hood for a little bit each day starting next week! I will be eight weeks post partum at that point. I will of course see how my body feels but I'm ready to go back to biking daily! 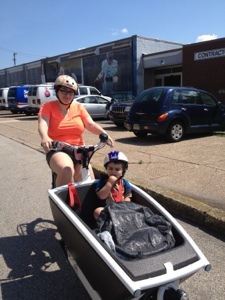 The day we bought the Urban Arrow we watched our son climb all over it, ringing the bell, pushing the pedals and spinning the wheel. I turned to my husband and said we just bought our kids a lifetime of childhood memories. The more we ride with our kids and other families this statement continues to ring true. 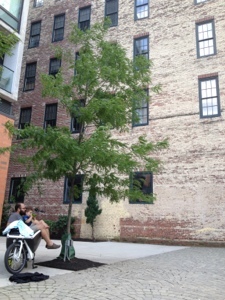 We rode up MLK to Fitler Square. The ride there went well, I felt way more confident on some tighter turns on the path. I do need to move the seat post up now that I have more confidence so my knees don't feel so impacted. I'd like to raise the handlebars up too. 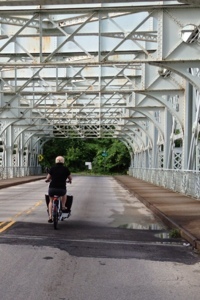 We took the Scullykill River Path after MLK and what do you know a freight train pulled in which forces you to walk your bike up and over the connector bridge. Ugh. Lucky for me I had a sweet husband who pushed the 100 pound bike up the bridge. It started raining when we got to the park. 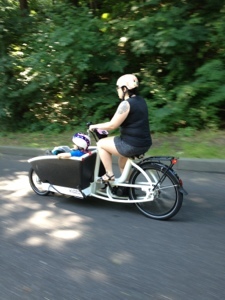 I was briefly concerned it might just be our family on the ride. But at 10:30 tons of families showed up. 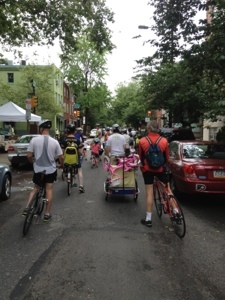 It was a smaller ride about twenty-five or so people but it went well. 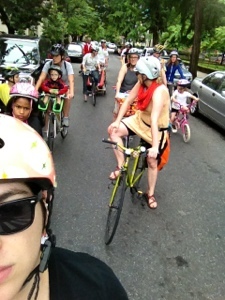 We tested out a new route which included some skinnier bike lanes but the kids and adults did so well. 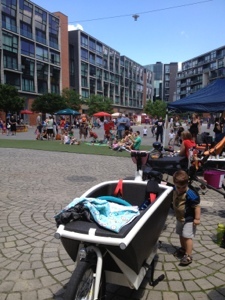 When we got to Sister Cities Park, there was a few families who couldn't get to the ride on time so they just met us there! Really good time had by most? All? When we got home the kids were nuzzled asleep in the box. They both had the look of a great time on their faces. Those lifetime of memories slowly made.